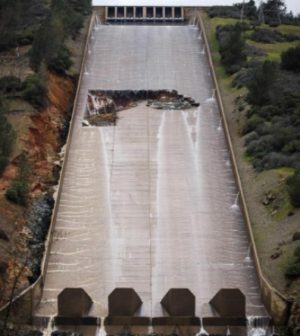 The giant crater carved by atmospheric rivers on the main spillway of the Oroville Dam and the subsequent erosion of the hillside of the dam’s adjacent never-before-used emergency spillway in early February 2017 not only triggered the evacuation of some 188,000 residents downstream of the dam; it also triggered a growing price tag for the emergency response, erosion mitigation and ultimate repair of the spillways. Following California’s torrential rains in 2017, the state’s Department of Water Resources (DWR) awarded an initial $275 million contract in April 2017 to Kiewit Infrastructure West of Omaha, NE to immediately plan and mobilize crews and equipment to begin construction in May 2017. This initial budget allowed Kiewit to begin work while the project design was completed. However, it was not an estimate of the total project cost. Final plans for the main spillway were completed in July 2017 and final design plans for the emergency spillway were completed and approved in August. As work continues to meet the November 1, 2018 public safety construction milestone, DWR has updated its cost estimates. On Wednesday, DWR release its most recent Oroville Spillways Construction and Cost Estimate Update. The current estimate for emergency response and to fully reconstruct the main spillway and emergency spillways is $1.1 billion. Cost estimates are based on actual and projected work and may be adjusted further as work continues through completion of the project in 2019. As with any project of considerable magnitude, cost estimates are affected by conditions onsite and direction from regulatory bodies throughout both design and construction. $630 million for main and emergency spillways work to include additional excavation on the emergency spillway hillside to reach competent rock, additional material for construction of the splashpad, and additional crews and equipment necessary to meet the November 1 public safety construction milestone. $310 million for related recovery work including debris and sediment removal, powerline replacement, permitting and development of access roads, DWR staff time, technical consultants and inter-agency support. This amount also includes additional staff time, technical consultants and inter-agency support to meet the November 1 public safety construction milestone, and an estimate for site restoration that will occur after construction of the spillways is complete. The estimated cost for the Emergency Response, which ended in May of 2017, remains unchanged at $160 million. Response activities included erosion mitigation for both spillways during the incident, sediment removal, installation of temporary transmission lines, staff time, technical consultants and inter-agency support. Progress on the main spillway is on track to meet the Nov. 1 public safety construction milestone to complete placement of all concrete on the main spillway. The upper chute is 63 percent complete and crews have placed 50 of 150 erosion-resistant concrete (ERC) structural slabs and two of 50 ERC structural walls on the uppermost 730 feet of upper chute. The middle chute is 77 percent complete. Crews continue to place ERC structural slabs and walls on the middle chute. To date, crews have placed 175 of 228 slabs and 51 of 76 walls. Placement of reinforcing steel and ERC slabs on the energy dissipaters, or dentates, at the base of the main spillway is ongoing. Repair work on the dentates is 45 percent complete. After the Nov. I public safety construction milestone occurs complete placement of all concrete on the main spillway will occur including dry finishing, concrete curing, joint sealing, completing sidewall backfill and site clean-up on the main spillway. Work crews have temporarily stopped roller-compacted concrete (RCC) placement on the Emergency Spillway for scheduled maintenance on the RCC batch plant. RCC placement will resume on Monday, Sept. 10. Placement of RCC on the southern half of the emergency spillway splashpad is 72 percent complete. Work on the emergency spillway site is not dependent on the public safety construction milestone and will continue after Nov. 1. The RCC buttress at the base of the emergency spillway will be built later this year. Drilling of steel dowels into the emergency spillway monolith structure that will support the buttress is already complete. Meanwhile, other work continues on peripheral projects surrounding the Oroville Dam. This includes an underground transmission line project along Oro Dam Boulevard East between Glen Drive and Canyon Drive and DWR met with the independent Board of Consultants for the 20th time earlier this week.